Many people experience a particularly frustrating issue. The computer turns on, you can see the lights and hear the fans, yet something’s wrong. The display shows nothing. What could cause this? There are lots of reasons for this problem and in the following guide we’ll be taking a look at each of them and see what are the best solutions. This troubleshooting guide is built with the assumption that your computer seems to be working. The screen is completely blank, no helpful information is shown on it. Without any other introductions, let’s try to figure out the reason why the computer turns on but doesn’t display anything. Before you start worrying about having a broken computer, and what complicated steps you’ll need to go through, test the monitor to see if that is actually the cause. It’s very likely that your computer has no problems and the real issue is the monitor. Testing the monitor isn’t very difficult and shouldn’t take longer than a few minutes (in most cases). Here are the steps to follow if you want to make sure that your monitor is faulty or not. Is the power cable properly set up? Are you certain that your monitor receives power? If the answer’s ‘yes’ to both of these questions, then check the power button or switch to ensure the monitor is correctly turned on. That’s a mandatory first step. Sometimes a cable adapter could be loosely secured. That’s often the case when you have small connectors. Make sure your monitor is firmly connected to the PC. In fact, disconnect and reconnect all the cables anyway, even if everything seems fine. It won’t hurt to refresh the connection. Access the onscreen interface of the monitor and turn the brightness and contrast to their maximum values. Maybe something’s wrong with the settings and everything looks too dark to be able to see. If you can’t open the settings interface of the monitor, that usually means the monitor isn’t working. 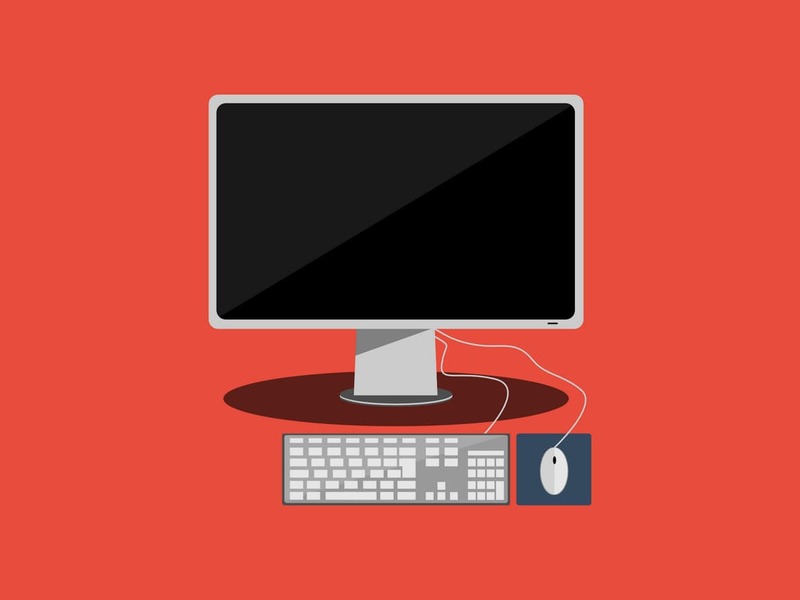 Assuming you have another monitor available that works correctly, connect that one to the PC to figure out if there’s a specific problem with the connection of your current monitor. If the new monitor works properly, that most likely means that your old one is a faulty monitor. In case the different monitor shows the same blank screen then you still have other options to try. Something important to mention regarding the connection of the second monitor is to always use the original cable. There could be an issue with just the cable of your current monitor so don’t test the other monitor with it. If you’re certain that no monitor appears to be working with the computer, then the most likely reason is a faulty video card or one that’s not properly connected to the PC. You’ve basically demonstrated that your computer is the problem and not the monitor. Now we’ll resume our troubleshooting guide to see what exactly could be causing this issue if the monitor’s not to blame. Is your computer coming from a fully turned-off state? This is something you will need to determine with absolute certainty. There could be problems with it not managing to resume a Sleep or Hibernate state. To see that your PC has fully power cycled, just turn it completely off by holding the power button for a few seconds. If it isn’t booting normally now, try the next step. Are you hearing a beep sound from the inside of the computer when it turns on? That’s actually a very helpful sign because the beep code can be analyzed to understand what’s causing problems. The beeping happens when there’s no way to display the error on the screen. The most typical issue when you hear the beeping is with your motherboard so you should definitely look into that more closely. Troubleshooting the exact beep code can be difficult, and it’s most likely not something you can repair on your own. But if you hear it, it definitely means you should get the computer checked with a professional. One solution to try is to get back to the factory BIOS settings on the motherboard. Perhaps a misconfiguration in the BIOS represents the cause of the issue you’re experiencing as the PC can’t fully start up. To do this you simply need to access the BIOS setup utility. Somewhere in there, you should find a ‘Reset BIOS settings’ option. You won’t find the option phrased exactly like that as motherboard BIOS menus can be different. Still, you can usually orientate in the utility you’re using by checking the typical places such as the bottom of the screen or the final options if there’s a list of settings to browse through. If your voltage switch from the power supply is set incorrectly, the computer might fail to power on, and in some cases, it can start up, but not completely. Check to see if this switch is set according to your country for the correct voltage. Sometimes you need to put in some more effort to figure out what’s wrong with your computer. Reseating is one option to try which has great fixing potential, but the downside is that you need to pretty much reseat all the components of the PC. Reseating is a basic process though, it simply means to detach something and then attach it back on. Let’s see which are the most important computer parts to reseat. Try these out to see if your issue disappears. There are lots of cables inside your computer and they all have important jobs to ensure the proper connections between all the components. Data and power cables need to be reseated so let’s see how exactly is that accomplished. With the computer turned off completely, the first step is to open its internal case. Depending on the case, you might need a screwdriver, otherwise just look for buttons on the rear or sides. This is a recommended thing to do before the reseating process of the cables inside. External cables and various attachments need to be removed anyway as they can hinder your work. This is usually done together when opening the computer case. How do you figure out whether a cable is a power connector? The easiest way is to trace it and see if it ends up connected to the power supply. There should be plenty of power cables inside your PC as everything has its own connector and that includes stuff like optical and hard drives. A large power cable should be found on the motherboard too. Just remove and then firmly reattach each power cable inside. This is a bit trickier as it requires you to handle each device separately. Choose a component to work with and unplug its data interface cable which goes to the motherboard. It’s important to remove the cable from both ends and then plug it back in. Take every device inside the computer through this process, like the hard drive or video card for example. With the reseating of the cables finished, take a final look at each device to make sure all the connectors are properly reattached. Pay extra attention to the motherboard area. Now that the job is done, all that’s left to do is to carefully close the computer case as well as re-connect all its attachments. Next, we’ll take a look at reseating the memory modules and expansion cards. As with the last reseating process, you should know by now that you need to ensure that your PC is powered down, attachments removed, and the case opened. With that in mind, let’s see how you handle the reseating of the memory modules. Finding the memory modules is not very difficult. Just look for the motherboard first. The installed RAM should be there placed in slots. To help you spot it more easily, look for black slots, those are usually the most common. There are special clips on each side of the RAM so you will need to find them and push them down simultaneously to release the module. The clips should be white and their role is to keep the memory in place in its slot. To make sure you’re doing it correctly, watch for the way the module pops out of the slot. It’s important to be gentle during this process. You shouldn’t damage the retaining clips in any way and don’t force it if the retaining clip is still engaged. Be patient and carefully remove the module ensuring that both clips are fully disengaged. With the RAM now out of the motherboard’s slot, put it in a safe place while avoiding any damage to the metal contacts of the memory. When you take out the memory you should be aware of certain notches found at the bottom of the module. These notches will be helpful to guide you when putting the RAM back on as they’re asymmetrically placed. Without touching the metal contacts on its bottom, take the RAM and place it back into the motherboard slot. Be careful once again when dealing with the memory retaining clips to correctly install the module. Expect to hear a ‘click’ sound when the memory is put back into its place with equal pressure on its sides. Look for the notches mentioned in the last step to make sure they’re aligned with the ones in the motherboard slot. Try to put it again if the notches aren’t correctly aligned. The reseating is done but you need to take a final look at the RAM and its retaining clips to be certain everything looks exactly as before. The clips have to be re-engaged in that same vertical position you’ve found them in. Don’t skip this step because the motherboard or the RAM can be damaged if it’s not installed correctly. As the memory is now verified to be reattached firmly into its slot, it’s time to close the computer case. Test to see if your issue is still there. If nothing changed, you should try reseating the expansion cards. Assuming the computer case is fully opened and all the other external cables and attachments are out of the picture, let’s take a look at the steps required for correct reseating of the expansion cards. Because all expansion cards are prevented from coming loose in the case through a retaining screw, you will need to be prepared to remove it. After you’ve got it out, place it somewhere safe because it will be needed when the reseating is finished. There are computer cases which don’t rely on retaining screws for securing expansion cards. In that case, refer to the manufacturer’s manual to figure out how to access that area and release the card. As the expansion card is a fragile component, be careful when you take it out of the case. With a firm grip pull it little by little from its slot. Make sure you avoid touching its electronic parts and that your working area is clear of cables. There’s a risk of damaging something else in the process, so this is why it’s important to work slowly and carefully. It’s possible to find some dirt or traces of damage on the expansion card so it’s recommended to take a close look at it. Check out the card’s slot too while you’re at it. The expansion card should have clean and shiny metal contacts on its bottom. If that’s not what you’re seeing, it means you have to clean it. The slot has to be unhindered by anything so the expansion slot can be properly connected. After the inspection is done, reinstall the expansion card in its dedicated slot. Before doing this, ensure that no obstructions such as small wires are in the way. You should try to prevent any accidental cuttings that can happen if wires are getting trapped between the slot and the expansion card. Putting the expansion card back on requires that same carefulness needed when removing it. Make sure it’s correctly aligned and don’t offer it more than a gentle push. A certain amount of resistance needs to be experienced when inserting the expansion card but avoid forcing it. Hold the sides of the card with both hands to ensure a firm grip. The last step before closing the computer case is to use that same screw that’s been previously removed and integrate the expansion card back into the case. Be careful with this screw and avoid dropping it onto any parts of the computer as it can damage them. It also goes without saying, but there’s a risk of electrical shorting if you can’t take the screw out of the case and need to leave it inside. Electrical shorts could be a possible cause for the computer being prevented from booting fully or displaying anything. An electrical short inside the computer can also cause other problems such as the computer shutting down by itself. There are two steps here to try and we’ll look at each other in greater detail. As previously mentioned, it’s important to make sure that no screws or other metal pieces are left out in the case. They can create electrical connections that put your computer at risk for electrical shorts. To check for loose screws we will first need to power off the computer and unplug the power cable. Then give the case a gentle shake to see if you can hear any rattling sounds. Screws are used for securing lots of internal components and it’s possible that one is a bit loose. After a few shakes, it’s likely that you will hear the loose screw falling to the bottom of the case – that’s in case a rattling sound can be heard initially. If that happens you will need to get the screw out with your fingers or tweezers if it’s stuck in an unreachable spot. Another cause of electrical shorts is due to wires or cables that somehow have lost their special coating that has a protective role. If that happens, the exposed metal could be making contact with any of the parts inside the computer. Take every cable used in your PC and carefully inspect it for signs of fraying. In case you discover one with its protective coating removed, it’s essential to replace it as fast as possible. The next troubleshooting step in our guide is to see whether the power supply in your computer works as expected. Even though the computer appears to be working as you hear fans and see the lights, there’s still a possibility of the PSU functioning incorrectly. When trying to figure out why a computer doesn’t work like it should, the power supply unit should definitely take priority during a troubleshooting process. That’s because it’s a piece of hardware that, on average, tends to create the most problems when your computer is malfunctioning. There are different methods you can use for testing the PSU in a computer and the most effective ones are by using a multimeter or a power supply tester. Each of these come with some advantages and disadvantages, so read on to figure out which one would work best for you. For this method, you will need to buy a multimeter if you don’t already have one. A screwdriver is also required. In case you don’t own a multimeter, here’s a quick selection of the best multimeters on the market. They’re inexpensive tools which can be handy in a variety of situations including this one. Executing a manual test with a multimeter has some disadvantages. There’s quite a lot of work involved on your part and it’s also not recommended for anyone as it could be a dangerous process if you’re not taking the right precautions. As it involves working with the PSU when it’s plugged in, that means you can accidentally damage the computer or worse, electrocute yourself. Testing the PSU with a tool specifically created for this purpose, a power supply tester, is obviously the recommended option. It’s safer and you can expect much more conclusive results as the testing process is automatic compared to using a multimeter. The problem with this method is that most people don’t have a PSU tester lying around so you will need to purchase it. This means you need to order one and wait for it before you begin testing the power supply. It’s usually more expensive than a multimeter. These are the best methods for testing your power supply. So what happens if your PSU fails a test? It’s not recommended to try and fix it. The best solution is to get a replacement. If it’s not working right, you’re doing yourself a disservice by keeping it. Finally, it’s strongly recommended to consider doing this step. Don’t skip on testing the PSU because anything less than optimal functionality can have disastrous effects for your computer. Power-On-Self-Test cards are diagnostic tools that can help you determine what’s wrong with a computer during startup. As its name implies, the POST card is used for hardware testing and discovers some errors known as POST codes. These errors can prove helpful to pinpoint the cause with precision whether it’s the hard drive, memory, or something else. Using a POST card is recommended if your computer still isn’t displaying anything on the screen even if you remove non-essential hardware from it. In other words, it will tell which of the remaining components is the culprit. If you have identical or equivalent hardware parts, you can try replacing the components in your computer with them. The process is done in a ‘one at a time’ style to figure out where the problem is. You will need to go through a test after every replacement. This step would only be helpful if you happen to have working spare PC parts. That’s obviously not always the case, so perhaps a less expensive approach would be to use the POST card discussed in the previous step to do hardware testing. If the cause can’t be determined and fixed even after following all the steps in this troubleshooting guide, then you’re probably better off by looking for a professional at a computer repair service. Another thing worth trying would be to see what the technical support from the PC’s manufacturer can do. Of course, if the computer is custom built, your only option is to find a professional. Speaking of custom built computers, if you’ve just finished assembling the PC and stumbled upon this issue, then a strong recommendation would be to check the configuration once again. Do the verification multiple times just to be absolutely sure. Hopefully, there’s just a configuration problem and there’s nothing wrong with the actual hardware.